The term “modern architecture” can conjure images of Frank Lloyd Wright’s intricate, linear designs, or the prominent shapes and forms of a building designed with Picasso in mind. 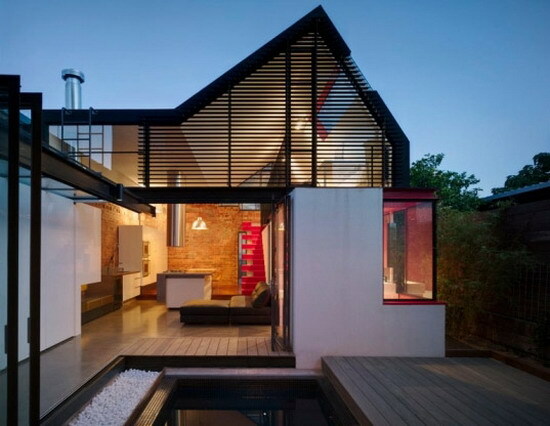 A modern home is typically one that is built in a simplified style, developed first in the 19th century and modified throughout the 20th as a reaction to the lavish designs of the Victorian and the Edwardian architectural periods. The buildings that laid the figurative foundations for modern architecture were stripped of unnecessary ornament to let the beauty of their simplified forms and functions take center stage. Engineering elements and utilitarianism play heavily into modern home styles, with materials like glass, steel, concrete, and iron used liberally in construction and showcased for their natural and raw beauty. 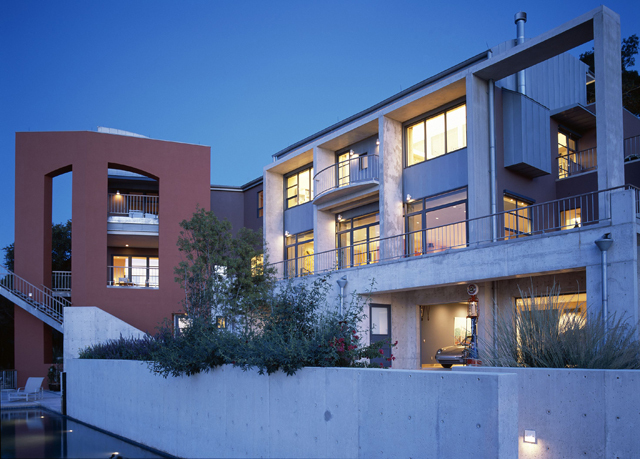 Modern and contemporary style homes are a growing and unique segment of the Austin housing market. While Austin generally has a select inventory for this type of home, there are ever-increasing numbers of contemporary jewels hidden throughout the city. In addition to Frank Lloyd Wright, other notable modern architects include Otto Wagner, Victor Horta, Water Gropius, Ludwig Mies Van der Rohe, Oscar Niemeyer, and Antoni Gaudi. 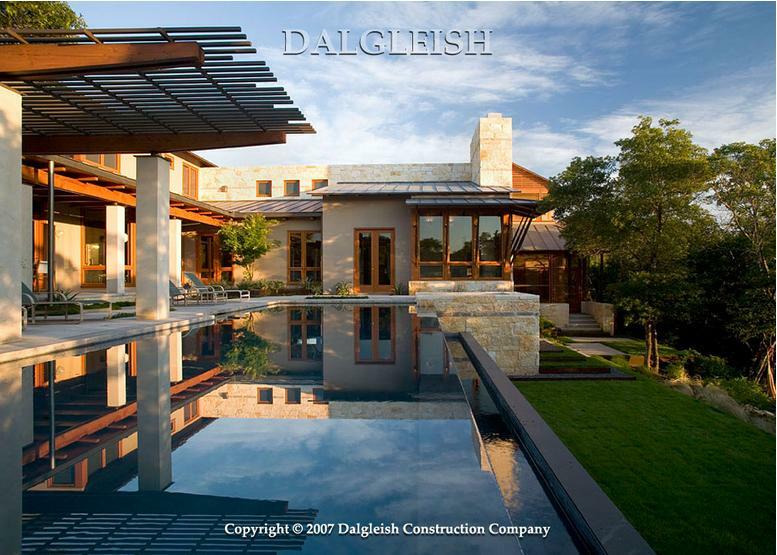 A compilation of accomplished Austin architects and builders who work in the modern style can be found below in our recommended list of Austin luxury architects and Austin luxury builders. 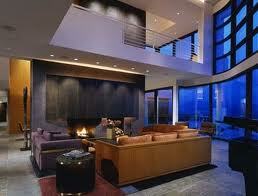 They can assist with new construction or remodels of modern/contemporary style homes. Active Solar Electricity Generation: Solar energy collection that employs one or more panels comprised of photovoltaic cells to convert the sun’s light waves into electricity. An ideal climate paired with a large solar-panel array and ample battery storage will generate all the electricity needs of a home with low to moderate energy use. Active Solar Heating: Collecting solar heat energy using solar thermal cells. A solar thermal installation can reduce winter fuel costs by 40-80% and minimize the consumption of non-renewable resources. Adobe: A building material that is natural and extremely durable. In hot climates, it is ideal for energy efficiency, staying cool in the midday sun. In winter, the walls stays warm due to the thermal properties of the adobe bricks, which are warmed by the sun each day. Upon nightfall, that heat transfers to the interior space. Advanced House Framing or Optimum Value Engineering: A framing techniques that utilizes less lumber and produces less waste. Since insulation material is used in place of some of the lumber, the home has the added bonus of being more energy-efficient. Art Deco: A decorative design style first made popular in the 1920s and 1930s. The name originally comes from the exhibitions of Les Arts Decoratifs. Cubist painting and African and Native American art influenced the development of Art Deco, but the polished forms of modern machinery and aircraft were also inspirational. The style is characterized by stepped forms, rounded corners, triple-striped decorative elements, and the use of chromium and black trim. Bakelite: The trade name of one of the first plastics to come into wide use. Invented in 1907 by the chemist Leo Baekeland, the material is a good insulator against both heat and electric current, and can easily be molded while remaining relatively inexpensive. Bauhaus: A German school of design that, in the 1920s and 1930s, became a leader in the development of modernism. Emphasis was placed on factory-produced designs that were simple, functional, and industrial. Certified Green Professional: A component of the National Association of Home Builders’ National Green Building Program, this title is given to builders who have received a minimum of 24 hours of training in sustainable building practices. Cob Home: Similar to adobe, cob is a building material made of a mixture of sand, clay, water and dirt. 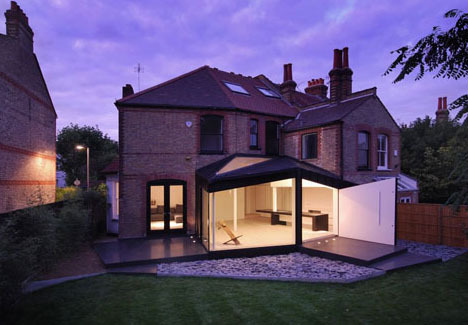 Its natural components, durability, and exceptional thermal-mass value have created a resurgence in use. Compact Fluorescent Lightbulbs (CFLs): CFLs are lightbulbs that last 10 times longer, use about 75% less energy and generate 90% less heat than traditional incandescent bulbs. Compost: Turning kitchen scraps, grass clippings, and other plant and vegetable waste into a nutrient-rich natural fertilizer. Regularly maintained and rotated in a simple mound or container, the discarded organic matter will eventually break down into a precious soil-like substance that helps flower and vegetable gardens thrive. Many kitchens have compost bins for scraps built under the sink, with large units for turning on the patio. Composting Toilet: Composting toilets look much like regular toilets but work like a backyard compost pile and use little or no water. They consist of a commode and a composting chamber with no sewer lines or septic tank. Once in the composting chamber, waste is broken down aerobically by bacteria, fungi, or even worms. Ventilation systems bring in oxygen and also create suction into the chamber, preventing odors from escaping. Daylighting: Utilizing strategically-placed windows, skylights, and light tubes in order to maximize natural daylight and minimize the need for artificial lighting. Dome Home: Immune to virtually any natural disaster, a dome home is an igloo-shaped residence known for its durability and supreme energy efficiency, primarily achieved by having up to 30% less surface area enclose the same amount of space found in a conventional square-shaped home. Drip Irrigation: A watering system of tubes containing holes at strategic intervals that keep flowerbeds and gardens well hydrated with minimal waste. A drip-irrigation system is much more efficient than a sprinkler, going straight to the roots of the plants with less evaporation or run-off. 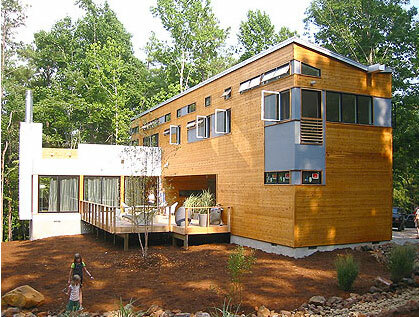 EarthCraft House (ECH): A program aimed at attaining eco-friendly homes. It is a green building initiative created in 1999 that educates builders on how to construct homes that are up to 30% more energy efficient. Earth-Sheltered Home: A home that is built entirely underground or banked into the Earth so it is better protected from extreme outdoor temperatures, making it superbly energy-efficient in regards to heating and cooling needs. Earthship: Earthships marry a multitude of green features together under one roof with the goal of complete self-sufficiency. Typically made of upcycled tires packed with dirt, these dwellings leverage myriad eco technologies, such as daylighting, passive solar heating, thermal-mass indoor temperature control, natural ventilation, and water catchment systems. Energy Star: A government-backed initiative to promote energy efficiency. Everything from major household products to newly constructed homes can earn the Energy Star label when they exhibit energy-bill savings and a reduction in greenhouse-gas emissions, as defined by the Environmental Protection Agency and US Department of Energy. Geothermal Heating and Cooling: Also known as a Heat Pump, a geothermal heating and cooling system conditions indoor space by using the Earth’s stable and renewable temperature. Regardless of whether it’s a 90-degree day or below freezing on a winter night, the Earth—possessing more thermal mass power than anything else—always remains somewhere between 45 to 75 degrees. Cost savings are achieved within five to 10 years, thanks to its highly efficient nature. A heat pump also produces significantly fewer emissions than conventional heating and cooling methods. GREENGUARD Indoor Air Quality Certified: Household products, ranging from building materials to window treatments, are eligible for this certification when they demonstrate low particle and chemical emissions as defined by the GREENGUARD Environmental Institute. Green Home: According to the National Association of Home Builders, a home qualifies as green when it conserves water and other natural resources, is energy efficient, uses recycled or sustainable products, and protects indoor air quality. Green Roof: Instead of traditional shingles, a green roof is covered with soil and plants. This roof absorbs rainwater rather than corralling it into a storm sewer, provides superior insulation against both hot and cold weather, absorbs carbon dioxide, creates oxygen, and helps to counteract the steamy summer temperatures in urban areas. Greywater Recycling System: The water that goes down the drain after you wash dishes, do laundry, or take a bath is known as greywater. It accounts for 50-80% of wastewater generated by a household. When the water from this use is diverted to the home’s toilets, you now have a greywater recycling system estimated to reduce a household’s water consumption by an average of 30%. Home Envelope: A home envelope is the entire exterior of your house, including the walls, roof, foundation, doors, and windows. The level of environmental integrity of the home envelope is what determines your house’s degree of energy efficiency. International Style: Term used to describe architectural design that is simple, functional, and unornamented, following the theoretical teachings of Bauhaus and the leading figures of Modernism. The term was used as the title for an exhibition at the Museum of Modern Art, NY in 1932. Most of the work shown shared characteristics of flat roofs, large glass areas, plain white walls, and an emphasis on the use of steel and concrete as building materials. Knoll International, Inc.: This manufacturer is one of the top producers of quality modern furniture, best known for their office systems and the application of the corporate identity concept in design. The company manufactures modern designs by designers such as Eero Saarinen. The Knoll designs reflect post modern and high tech styles. LEED Certification: Leadership in Energy and Environmental Design. LEED is a green-building certification system. Covering all aspects of constructing and maintaining buildings to make them more environmentally friendly, both residential and commercial properties are eligible for LEED certification. Light Emitting Diode (LED) Bulbs: A light-emitting diode (LED) is a semiconductor device that glows when an electric current runs through it. Used as lighting, these bulbs last up to 50 times longer and use one-sixth the energy of incandescent bulbs and last five times longer and use half the energy of CFLs. Their major eco-friendliness and other advantages make them ideal for home lighting and many other uses. Low-E Windows: Good for any climate, Low-E windows are coated with layers of microscopic metallic oxide that provide great insulation. Application on outer panes blocks heat in warm climates, while inside pane application helps trap heat in cold climates. Memphis: A Group of designers of furniture and household accessories who were known for erratic, illogical, avant garde, and anti-establishment style. Bright colors, fantastic forms with a touch of "kitsch" characterize the Memphis designs produced between 1950 and 1970. With its playful and mischievous departures from the order and logic of earlier modernism, Memphis has recently been regarded as a viable, classic style. Post Modernism: A term that has come to describe the stylistic developments that depart from the norms of modernism. Design directions introducing color, ornament, references to historical styles, and elements that sometimes appear eccentric or disturbing have come into increasing use. The Memphis group in furniture and smaller objects display post-modern characteristics. Off-the-Grid: When a home is so self-sufficient that one or more public utilities are unneeded 100% of the time, it’s considered off-the-grid. 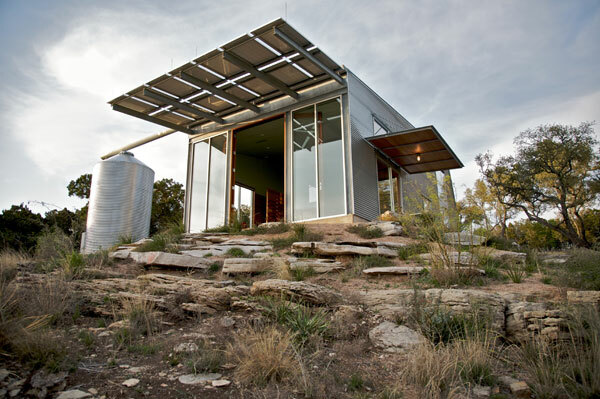 Dwellings with a freshwater source, an extensive solar or wind energy setup, etc., are most apt to achieve off-the-grid status. Papercrete: Made of paper fiber and cement, papercrete is a housing material with great insulating qualities that keeps paper out of the landfill and will lower heating and cooling bills. 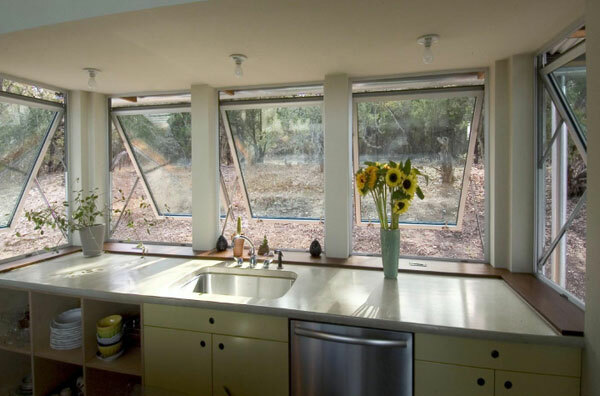 Passive Solar Heating: This simple, design-oriented technology harnesses the sun’s heat energy without the need for electrical devices of any kind. Passive solar heating can mean having lots of south-facing windows for maximum sun exposure on cold winter days. Pervious Concrete: Concrete designed to be extremely porous so that rainfall passes directly through to become groundwater instead of running into sewers or retention ponds. Pop: Popular, art historical, and critical term used for work developed in the 1950s and 1960s that drew its inspiration from commercial art expression, including packaging, the art of the comic strip, the vocabulary of film animation, and advertising art. The style opened up avenues of expression that had previously been regarded as too frivolous to have any role in architecture and design. Prefab: Prefabricated homes, often referred to as prefab homes, are dwellings manufactured off-site in advance, usually in standard sections that can be easily shipped and assembled. Pumice-Crete: An alternative to conventional concrete, it uses crushed volcanic rock instead of sand and gravel in order to render a lightweight yet load-bearing building material. It’s a great insulator due to pumice’s ability to trap large amounts of air. Radiant Heating: More efficient than baseboard or forced-air heating, radiant heating uses air, water or electricity to heat a house’s floors, walls or ceiling. They in turn heat the entire home. Hydronic radiant floors, those that use water, are the most environmentally friendly and efficient. Radiant floor heating systems work best when paired with ceramic tile flooring, thanks to the tile’s conduction and thermal mass properties. Rain Garden: A rain garden takes the abundant rainfall runoff common in urban areas out of the storm sewers and into a naturally depressed land area where a water-loving native garden is planted. In residential settings, rain gardens are typically placed at the exit point of a gutter downspout. Rainwater Catchment System: A rainwater catchment system, such as a rain barrel, stores rain water until you need it to water your garden or wash your car. A more advanced system collects water in a cistern and uses a pump to distribute it throughout the house for flushing toilets and washing laundry. Rammed Earth: Similar to adobe and cob, rammed Earth can last indefinitely and cost up to a third less than a standard frame house, while eliminating the need for toxic building materials and deforestation. It’s made by compressing a mixture of mud, gravel, chalk and lime in reusable forms and is known for its extreme durability and excellent thermal mass properties. R-Value: R-value measures the effectiveness of insulation materials. The higher the number, the better the insulation power and the lower your heating and cooling costs. Spray foam is an example of a type of insulation with a high R-value. Septic Tank System: Approximately 25% of Americans use stand-alone septic systems—as opposed to tying into city-sewers—to effectively treat wastewater, and they are often the only option in rural areas. Standard septic systems consist of a tank, drainfield, and the surrounding soil. Septic systems are inexpensive to maintain but do require some vigilance to ensure smooth operation. Siting: Choosing the greenest location to build a house. Siting takes many factors into consideration, including impact on the ecosystem, proximity to infrastructure, and south-facing orientation, in order to take advantage of the sun’s warming properties. Solar Panel: Also known as a photovoltaic module or photovoltaic panel, a solar panel is an interconnected assembly of photovoltaic cells that convert sunlight to electricity. To create an adequate amount of electricity, often several panels are joined into what is called a solar-panel array. Usually the array is connected to a battery to store the power for use at night or on cloudy days. An inverter and voltage sensing transfer switch is required to create the proper electric current for home use. Solar panels can be mounted on a rooftop or be freestanding. Solar Water Heater: Free energy emitted by the sun can be turned into a hot shower when a solar water heater is installed on your rooftop. It uses the sun's energy to partially or completely heat your household water supply. Straw-Bale Construction: A method to achieve load-bearing qualities and great insulation from a renewable resource, straw-bale construction stacks bales on top of a raised foundation, ties them together, and then covers them with plaster or stucco. Super Adobe: Also known as Superblock, Super Adobe uses fabric bags filled with adobe to form sustainable, dome-like structures that are extremely durable. Super Adobe structures go up quickly and cheaply and have the same thermal mass properties as traditional adobe. Sustainability: The extent to which something or someone can independently endure. 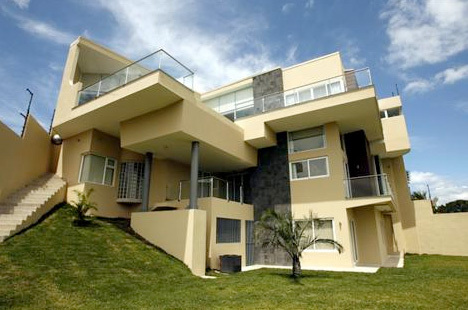 For a home to be considered sustainable, it must be maintained over the long-term without depleting natural resources. Sustainable Community: A neighborhood or town made up of sustainable infrastructure, businesses, and homes whose inhabitants work together to tread more lightly on the Earth. Such a community can be planned and built, or an existing neighborhood can be modified to achieve such sustainability. Tankless Water Heater (On-Demand or Instantaneous Water Heater): Whenever a hot-water tap is turned on, cold water is instantly heated as it flows through a small heating unit, thus avoiding wasted energy. Also called “demand” or “instantaneous” water heaters, they achieve the greatest efficiency gains when used in a household with lower than average hot-water consumption or when installed at each hot-water outlet. Water Well: A structure or hole in the ground that provides access to groundwater. It is created by digging or drilling deep enough to reach an underground aquifer. The water is drawn up in a container or by using a pump. Often it is stored in an underground or above-ground tank. Wind Turbine: An energy creating device that relies on the strength of the wind. Similar to solar panels, any excess energy generated by the turbine is stored in batteries where it can be used during non-windy times. Xeriscaping: This approach to lawns and gardening utilizes a diverse variety of native, climate-friendly and/or drought-tolerant plants, while taking measures to avoid water runoff and evaporation. It is ideal for drought-prone climates.